Blurb: After 11 years, The Clay People returns with a decidedly strong record that may prove to be one of the band’s finest hours yet. The history of The Clay People is a certainly colorful one riddled with several instances that seem almost out of the rock & roll handbook – numerous changes in lineup, all of which contributing to the band’s ever evolving style, topped off by record label conflicts and bouts of substance abuse. And yet, over the 27 years since the group’s Toy Box EP debut, The Clay People has been a beloved name in the coldwave scene, becoming a powerful underground force that retains the mechanical backdrops of the band’s early industrial style but strengthened through a decidedly alternative rock/metal veneer that has placed the band on the periphery of the mainstream. After The Clay People’s 1998 self-titled effort brought the band newfound acclaim and commercial attention, audiences would have to wait nine years for a new album, with 2007’s Waking the Dead proving to be a dubiously uneven follow-up. Another long period of inactivity followed before the band once again reunited to perform at the first two ColdWaves events, with the promise of a new album looming on the horizon over the next four years. 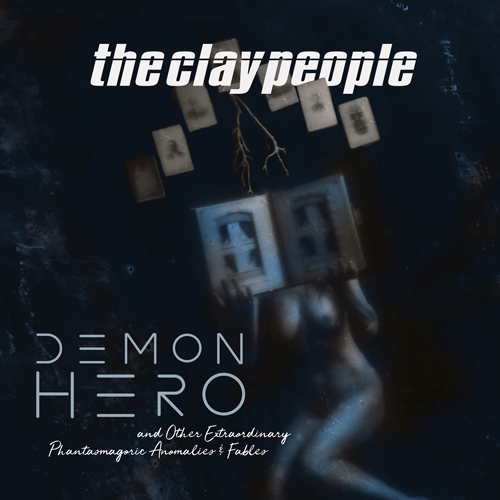 Now, The Clay People rewards us for our patience with Demon Hero and Other Extraordinary Phantasmagoric Anomalies and Fables… a cumbersome title, but one that more than accurately describes the band’s penchant for horror themed bouts of lyrical phantasy underscored by what may prove to be some of the most intricate and progressively crafted songs in The Clay People’s oeuvre. “Utopian Lie” kicks off the proceedings, and from Brian McGarvey’s fluid guitar riffs and Dan Dinsmore’s dynamic percussion topped off by Dan Neet’s voice scathing in both its fury and keen melody, the band wastes no time kicking into high gear. This along with tracks like “My Own Worst Enemy” with its particularly striking chorus, “Bloodletter” with its rhythmic vocal delivery and descending progressions, and the guttural immediacy of “Now,” all hit with the kind of blunt alt. metal force that defined the band’s output 20 years ago. Other tracks showcase more sophisticated compositions full of changes in time signature, tempo, and mood. For instance, “genRX” begins as a hard hitting alt. metal anthem, the children’s chants of “Medication” making for a decidedly catchy moment amid staccato beats and offbeat progressions that finally give way to a slow growling outro. And then there is “HeX Machine” as it alternates between a 9/8 and a 4/4 count without losing its menacing but fluid motion, shrill electronics creeping through the mix as the howls of “I want to believe in you” resonate with the blend of anxiety, desperation, and belligerence that Neet has cultivated in his voice since The Clay People’s beginning. But perhaps the finest moment Demon Hero beholds is the record’s penultimate track, “Colossus,” as a driving drum and bass rhythm pummels through the speakers with guitars monolithic and monstrous, the chorus of “I am Colossus” resounding with fury and might; it’s one of the band’s best songs… period. In many regards, Demon Hero is not just a new beginning for The Clay People, but also a celebration of the band’s past. For instance, songs like “Strange Day” and “Palegod” are revisited with the more polished approach that fans have come to expect from the group over the last 20 years, with the mechanical rhythms and starkly industrial atmospheres of the original versions, especially on the latter track, giving way to a brutal onslaught of organic grooves and riffs that also manage to retain the songs’ aggressive characters. With the subtle addition of Chris Wyse’s cello, the melodious “Strange Day” is remade into the radio-ready single it always was with all the potential to attain hit status, while the furious cover of “Firestarter” is notable not just for its faithful reverence to The Prodigy’s original, but also for incorporating the verse lyrics to “Lethargic” from The Iron Icon, making the song a second callback to the EP. It might’ve been surmised that having Neil Kernon return to mix Demon Hero as he had on the band’s previous two albums was an attempt to capture lightning in a bottle once again, and his sonic touch does give the album a sense of continuity and consistency. This is actually quite impressive as the album was recorded over several years with a host of guest musicians coming in and out of the fold – from past members like Mike Guzzardi and Eliot L. Engelman and longtime friends and collaborators like Wade Alin, Rob Zilla, and Walter Flakus to newer elements like Karl Von Heilman III, Scoops Dardaris, Phil Montelone, and the aforementioned Chris Wyse. Further changes include the addition of bassist Eric Braymer and second vocalist Vegas Nacy, their presence already having intensified the band’s signature live show, while McGarvey and Dinsmore took over production duties to ensure this record would be 100% The Clay People. It’s a solidified merging of alt. metal and coldwave along with more refined songwriting that is sure to please longtime fans as well as attract some new crowds. Demon Hero may have seemed like an impossible feat as the record’s gestation was so riddled with uncertainty and turmoil that few imagined that it would see the light of day. Thankfully, The Clay People more than delivered on its promise and potential with an album that can be looked upon as one of the band’s finest hours.